A British Airways flight arriving at London's Heathrow Airport (LHR) from Beijing crash landed at LHR early this afternoon, local time. There were 136 passengers and 16 crew on board the B777-236ER, operating as BA Flight 38. No one was seriously injured, but the aircraft was severely damaged. There was no fire. Early reports suggest that the aircraft lost power on final approach. The aircraft landed hard on the grass inside the airport's perimeter fence, and skidded several hundred meters before coming to a stop near the threshold of runway 27L. All passengers and crew evacuated the aircraft using emergency slides. There were reports of minor injuries to several people. 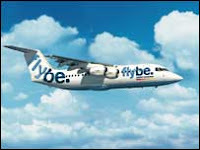 Several news media outlets interviewed passengers who were on the flight. They said there was no warning from the crew, and that most people did not realize that the plane had landed short of the runway until it had come to a stop. The cabin crew carried out the unplanned evacuation immediately, and without further incident. Click here to view a video of a BBC News interview with some passengers from BA Flight 38. 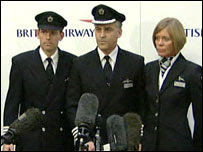 Mr. Willie Walsh, the CEO of British Airways, praised the crew's actions in a statement to the press. Part of his statement is included in this video posted on YouTube by the Associated Press. Congratulations to the crew of BA Flight 38 for a job well done. Icelandair's cabin crew have agreed to show solidarity with the airline's pilots by refusing to work overtime. According to a news report from Reykjavik, members of the Icelandic Cabin Crew Association (FFÍ) met on September 10th to discuss the issue. “There is a great solidarity within the group,” head of FFÍ Sigrún Jónsdóttir told Morgunbladid, adding there had been a good atmosphere during yesterday’s meeting. About 160 of 605 cabin crew workers listed at Icelandair attended the meeting. Jónsdóttir said FFÍ members had discussed possible counter measurements with Icelandair’s board for those who have not been made redundant, like being offered a vacation, paid or unpaid, or reduced working hours between December and March. Some Icelandair flights were canceled earlier this week because of the wage dispute between the pilots and the airline management. 19 year old Melissa Patton joined the company in 2006 and has been wowing our customers ever since and always been a winner in their eyes. We would like to wish her huge congratulations on this fantastic achievement. Melissa rose through the ranks of the competition to be crowned Miss Northern Ireland on Monday evening and was presented with a tiara and sash from current Miss World. Besides picking up the title, Melissa, from Belfast, is now entered in to the Miss World pageant, held in China, on 1st December 2007. So keep your fingers crossed for our girl and look out for her on your flight soon! I've been working with Jet2 for nearly two years now and I think it's provided me with a really good background for my role as Miss Northern Ireland. An important part of being an air hostess is grooming and presentation - that comes from having to have hair and make-up sorted for those 4am starts. I'm well used to early starts and meeting and greeting members of the public. I'm also very punctual. The plane doesn't wait for you if you're not there. Although I did my A levels in media studies, English literature and religious education, I didn't want to go to university. It was actually through an advert in the Belfast Telegraph that I applied for my job. I sent away my CV and cover letter to Jet2 for an interview and was recruited. I think young girls need more responsible role models than some of the women currently in the media. They need real life women who eat and have curves. I'm totally against size zero - young girls should not feel that they have to be a size they are naturally are not meant to be. It's not healthy. Good luck to Melissa Patton in the upcoming Miss World competition. The flight attendants will receive a 3.4 percent increase, which the airline had already agreed to apply to ground personnel, from July 1, Ver.di said in a faxed statement. Lufthansa spokeswoman Stefanie Stotz said negotiations are ongoing and declined to comment further when contacted by Bloomberg News. Ver.di said Feb. 17 the 3.4 percent pay-raise agreement it negotiated for 27,000 ground-crew workers also applied to 15,000 flight attendants it represents. Lufthansa argued that cabin crews are already covered by a May 2005 contract with the UFO flight attendants' union providing raises of at least 2.5 percent as of January 2007 and lasting through December 2008. Recent disagreements between Lufthansa and its cabin crew have been contentious, recently causing several disruptions in flight service as cabin crews in Berlin stopped work to demand higher wages.